Anyone who knows me well knows that I love risotto. It’s probably one of my favorite things to make. Unfortunately, all that arborio rice isn’t exactly the healthiest thing to be eating with great frequency. So, I’ve come up with a few healthier versions using barley, a super-grain that is actually a great alternative to short grain white rice. Barley is extremely high in fiber and packs lots of other nutrients such as selenium, copper, manganese, and phosphorous. 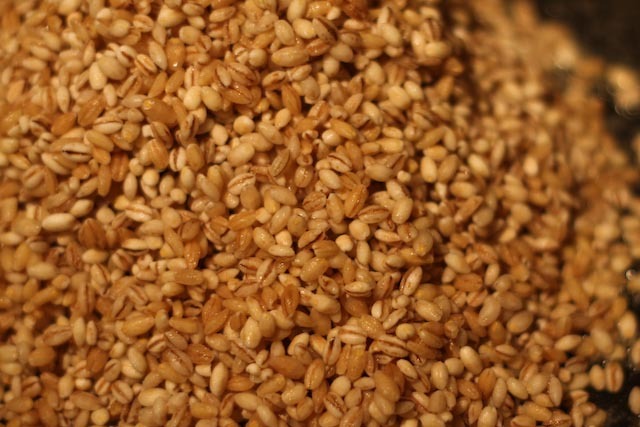 Barley also helps lower cholesterol and improve digestion and regularity. A super-grain, indeed! Additionally, substituting vegetable broth for chicken broth makes this dish vegetarian! 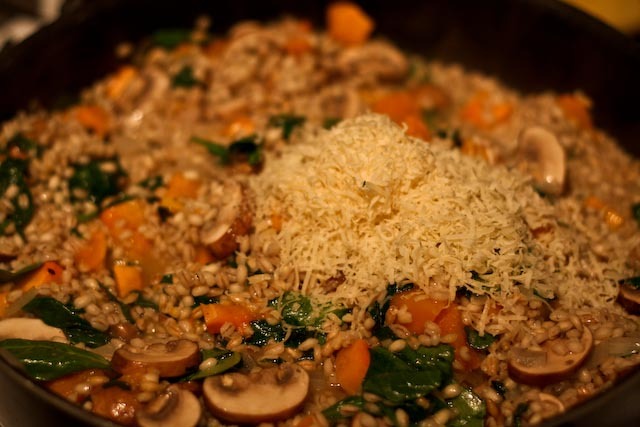 The risotto is quite easy to make, although it does require a bit more attention than simply cooking rice or barley on the stove-top, but it’s worth it – I swear! For this version, I added in roasted butternut squash, sliced crimini mushrooms, spinach, and fresh basil. All topped off with Parmesan cheese! 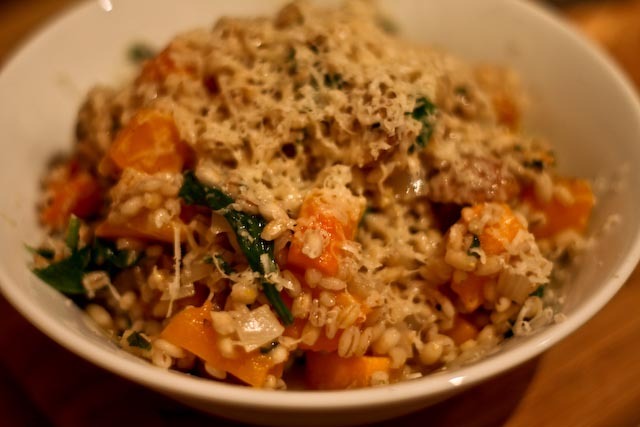 I roasted the butternut squash beforehand, which I would suggest doing if you plan to add a dense squash – like butternut – into a stove-top risotto dish. 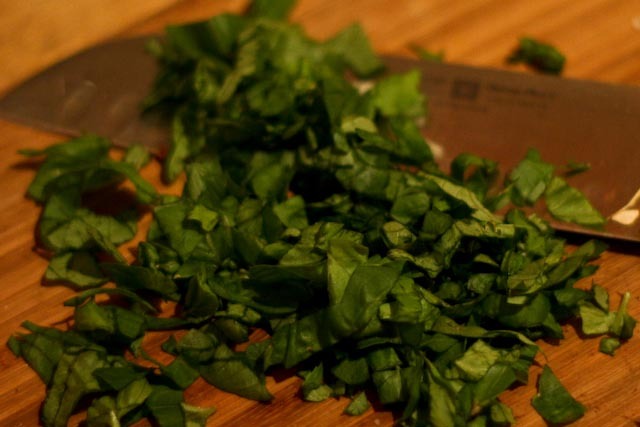 The recipe below makes about 4-6 servings, depending on whether you want to serve it as a main course or side dish (nutrition information is for approx 1 cup servings). 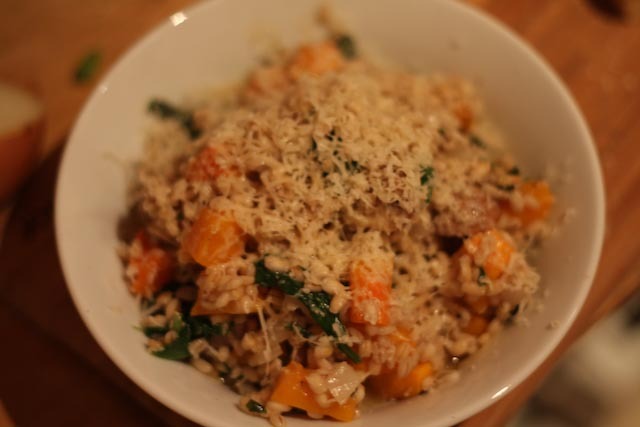 This risotto keeps well and make for some awesome leftovers – I just had some for lunch. Yum! Hope you enjoy my healthy twist on one of my favorite dishes! Heat oven to 350°F. 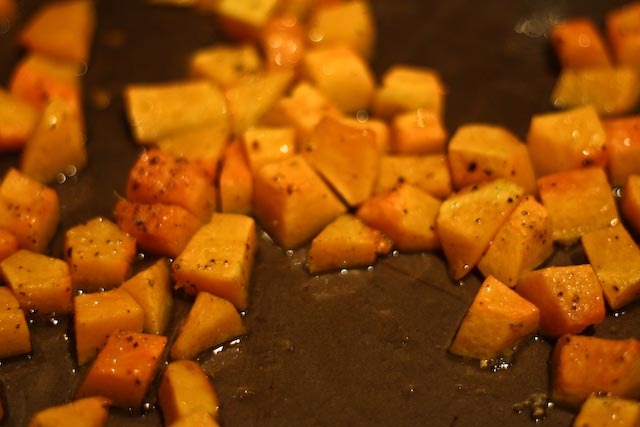 Place butternut squash pieces on a baking sheet. Drizzle with olive oil and season with salt and pepper, using hands to toss and coat the squash. Bake for about 20 minutes, until the squash is just tender. Meanwhile, heat the broth in a sauce pot over medium heat, but do not bring it to boil. In a large, deep-sided skillet, melt butter and a little olive oil over medium heat. Add onion and saute for a few minutes until translucent. 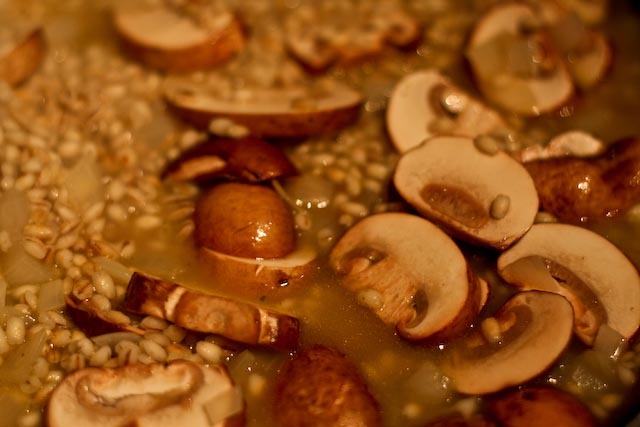 Add barley, and cook for a few minutes, stirring occasionally. With a ladle or measuring cup, add about 1 cup of broth over the barley and onions, and cook, stirring often, until the broth is absorbed. Continue adding broth 1/2 or 1 cup full at a time (Note: you may need more or less broth, so taste the barley along to way to gauge tenderness. Cooked barley should be a bit chewy with a nutty texture, but not crunchy). 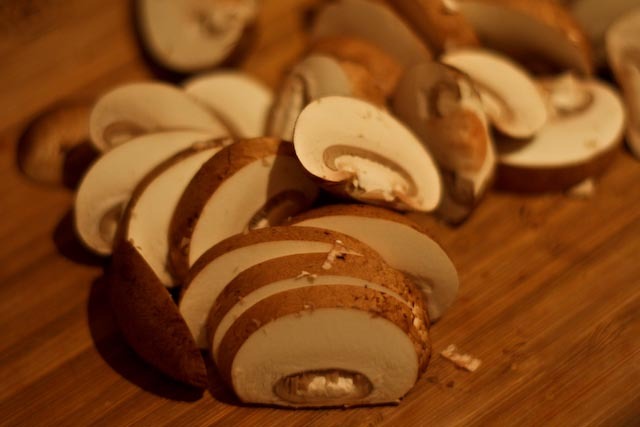 With the last addition of broth, add the mushrooms and let them cook until tender. Season with salt and pepper. 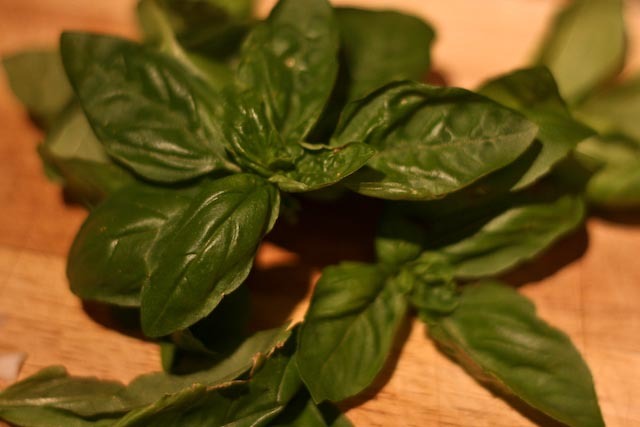 Mix in the squash, spinach and basil. Remove from heat and add the Parmesan cheese, making sure to mix well. Serve warm. This looks delicious 🙂 Adding it to my list of things to make… right after your pomegranate winter salad!